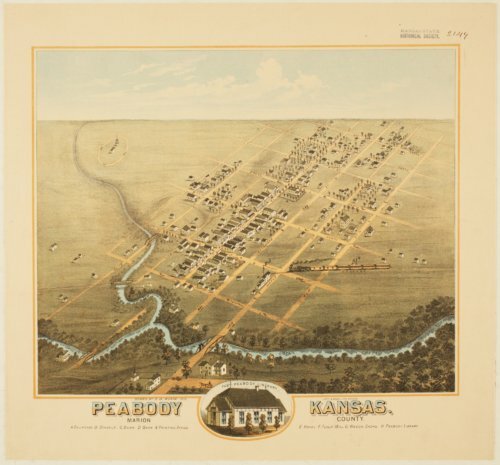 This colored lithograph is a bird's eye view of Peabody, Marion County, Kansas. The legend at the bottom of the image identifies churches, schools, banks, a printing office, a hotel, a flour mill and wagon shops. The business district is very distinct. The Atchison, Topeka, and Santa Fe Railroad ran through the town. The inset in the middle bottom depicts the Peabody Library. There is a race track in the upper left area of the lithograph. It was drawn by D. D. Morse in 1878 and published by Lott & Zeuch Lithograph, Chicago, Illinois.